This program presented two works by the Ghanaian American filmmaker Akosua Adoma Owusu (b. 1984, Alexandria, VA). Owusu uses various production techniques to visualize a state of “triple consciousness,” a term she coined in reference to a central tenet of the sociologist and civil rights activist W. E. B. DuBois’s landmark text The Souls of Black Folks (1903). DuBois’s “double consciousness” accounts for the experience of black Americans negotiating a sense of selfhood in the face of discrimination and cultural dislocation. As part of the first generation in her family to be born in the United States, Owusu extends DuBois’s concept to speak to the crisis of heritage and assimilation for African expatriates and their US-born children. The experimental short Intermittent Delight (2007) uses montage and sound to create an unsettling disconnect between what is viewed onscreen and what is heard by the viewer. Emblematic of what the film scholar Aimee Israel-Pelletier describes as “the orchestration and representation of potential chaos—that is, of multiplicity, dissimilarity, paradox, and contradiction,” the film presents a pastiche of images in order to generate the potential for critical dialogue. The sound track of traditional Asante adowa music lends a percussive backbeat to the quick crosscuts to images of pulsating batik (a patterned fabric common in Western Africa); Ghanaian women weaving textiles; advertisements for home appliances; and young white Americans dancing to music not included on the soundtrack. The use of batik alludes to the cross-cultural exchange between African countries and the West as a result of colonialism, trade, or immigration. The weavers’ solemn labor haunts the film when presented in conjunction with scenes of American domesticity and leisure, highlighting the disparities between what constitutes women’s work in different parts of the world. The film Kwaku Ananse (2013) combines narrative form, autobiography, and fantasy to approach a third space of cinematic language. 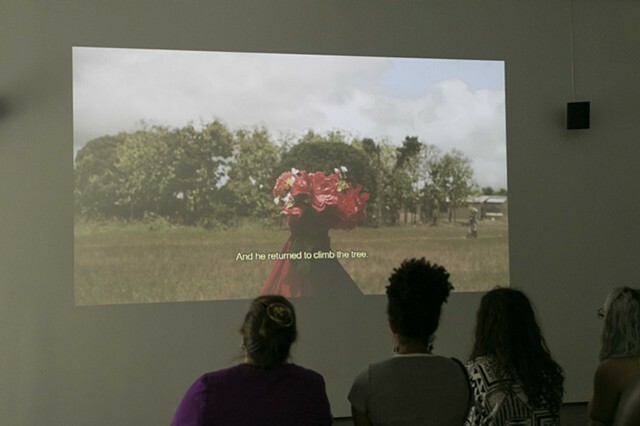 The work, made after the death of Owusu’s father, focuses on the journey of a young American woman to Ghana on the occasion of her father’s funeral. Confronted with news of her father’s infidelities during her visit, she resolves to make a pilgrimage to the forest in search of his spirit. Her father is presented as the fabled Kwaku Ananse, a trickster of African and Caribbean lore who alternately inhabits human and spider form and works to reveal the duality of the human condition. The heroine’s travel to unknown territory foregrounds experiences of loss, grief, and reconciliation that are both universal and particular to those living in diaspora.